Concrete is known for its high porosity, thus, making it easy to acquire stains. Pigments of the spilled item get absorbed into the slab, leaving traces of it that is very difficult to scrub off. The most common causes are spilled paint, red wine, coffee, oil, and grease, to name a few. Sure, a degreaser can take most of the stain out but those that have penetrated deep are hard to reach. No matter how damage-free the slab is, the stain is enough to make it an eyesore. Refinishing the concrete surface can breathe new life into it without having to spend an exorbitant amount of money. It immediately enhances the look of the entire area while restoring the existing slab. It is easy to confuse refinishing with resurfacing. Although both are decorative concrete solutions, they are quite different from each other. Resurfacing provides a new layer while refinishing makes do with the slab itself. Resurfacing involves the use of concrete coatings and overlays while refinishing involves stains, polishes, and sealers. The first one is great for repairing concrete damage while refinishing is for masking off dullness, stains, and discoloration. Stained Concrete – One effective way of dealing with ugly stains and discoloration is by staining. Acid and water-based stains penetrate deep into the slab, making it impossible for the color to fade, peel, or flake off. Polished Concrete – Polishing slabs is a more practical method for acquiring shiny surfaces. It does not require regular tedious waxing, scrubbing, and buffing. It stays smooth and shiny with minimal maintenance ideal for any interior, and garage flooring ideas. Concrete Resealing – Most contractors would recommend to applying a layer of sealer on any surface. It seals off its pores, keeping it from absorbing dirt and moisture. Concrete overlay sealing also helps protect the slab from damaging elements and makes it easier to clean and maintain. 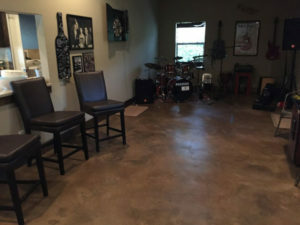 Have a space that could benefit from concrete refinishing? Call (773)377-8976 for a free consultation. Surface deep issues are frustrating and we at Chicago Concrete Resurfacing would want to relieve you of the frustration. We are a decorative concrete refinishing company with over 20 years of professional experience. We do repair and resurface concrete surfaces. We want you to stay informed so please do not hesitate to give us a call. We’ll schedule you for a free discussion and visit and throw in a free quote, too.